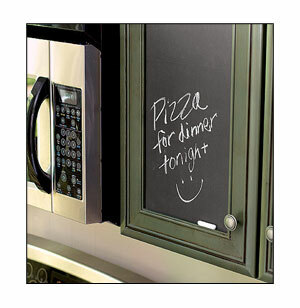 Enjoy being creative with your Peel & Stick Chalkboards! Peel and Stick vinyl wall decals are the most innovative way to decorate a room, create a unique atmosphere, enhance a living space, and do so with the ease of a peel-and-stick application. Peel and Stick Chalkboard wall decals combine function with fashion. Write notes, make lists, play games...the possibilities are endless. Works on walls, wood, glass, and more! Set of 2 - 9" x 12" sheets of Slate Gray vinyl chalkboard panels. Includes also 2 pieces of white chalk. Easy and convenient way to keep track of your busy life. Great for home, office, school, or anywhere you need a little organizing. Use in kids' rooms, kitchen, classrooms, etc. Works on walls, wood, glass, paper, and more! Easy to remove, will not harm most surfaces. Easy to readjust - wipes clean, without residue.